Jean Baptiste Camille Corot (1796-1875) was born in Paris. Early on he was a gentleman painter around Switzerland and Italy. One of the first plein air “pochade” painters, Corot’s early works showed “right on” values, fresh colour, and a sensitive treatment of light and form. He was what Kenneth Clark called “an optical painter with an innocent eye.” While keeping that eye to the French Salon and commercial success, he developed a parallel genre of classical and religious subjects. These he further combined into carefully composed landscapes that don’t seem to lean on his field-sketch experiences. By the early 1850s, perhaps in an even more catering mode, he started exhibiting soft, woolly, poetic landscapes. Grey greens and fuzzy browns dominated casual or nonexistent drawing. These works were of course a roaring success which ensured a crowd of imitators. (Someone said that Corot painted 10,000 pictures, 15,000 of which were in the USA.) In his seventies, for a new challenge, he produced portrait and figure studies that were reminiscent of the young Manet, whom he admired. Corot was a nice guy. In order to give young and self-taught painters a chance to be part of the action, he lobbied to lower the hurdles that were then necessary for Salon entry. Thus began the Impressionists. 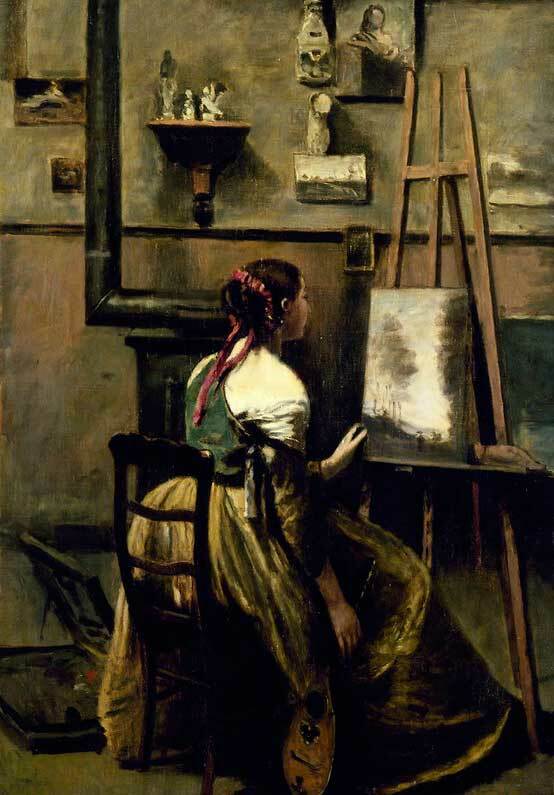 Corot was straight-forward, entrepreneurial, unpretentious and generous. He supported the blind painter Daumier and provided a cottage for Millet’s widow. 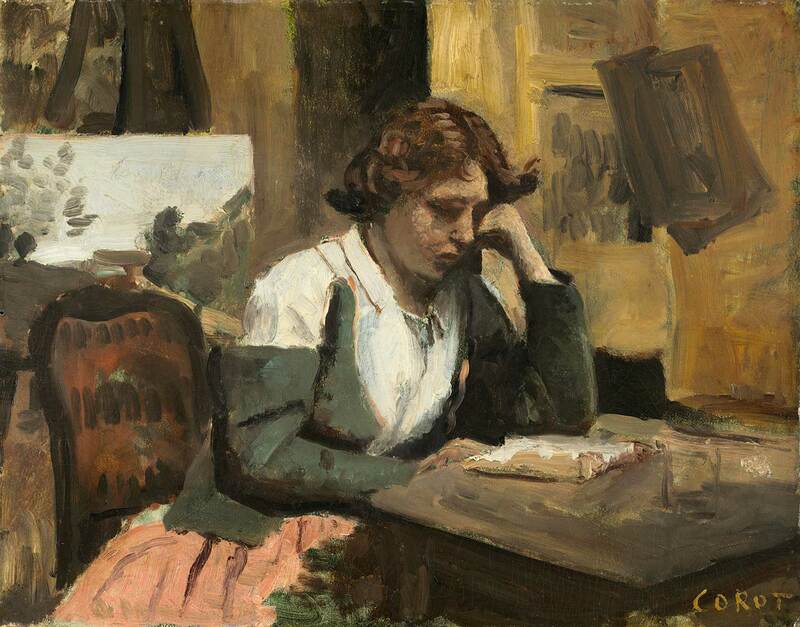 Corot wrote the book on creative giving and was one of the first whose work was a wiz-bang at fundraisers. Artists of all stripes can find themselves mirrored in historical figures. I’d rather be Corot than Pollock. In the brotherhood and sisterhood, art history is both comfort and challenge. Have you ever tried to make a palm tree fuzzy? 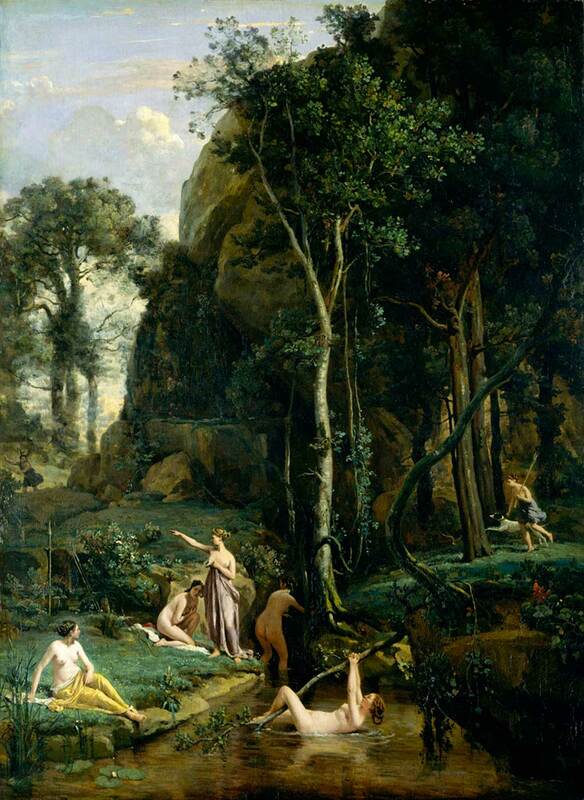 Esoterica: A Corot that I’ve always fancied is Diana Surprised at Her Bath. It’s in a private collection now but it’s often published. 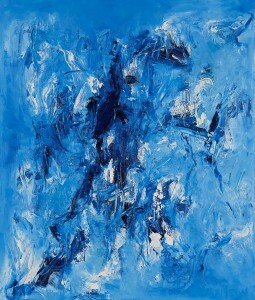 You can even buy a 72″ x 36″ hand-made oil reproduction of it for $299. It’s a sylvan scene — a pool under fuzzy trees — with, I think, five female bathers in various states of distress at the imminent arrival of a distant whoever. Diana, still in the pool, doesn’t seem to give a damn. It’s romantic, innocent, and in Corot’s mind, I’m sure it’s totally sincere. Okay, I’ll go somewhere and cool off. This letter was originally published as “Multi-stylist” on March 15, 2005. The Letters: Vol. 1 and 2, narrated by Dave Genn, are now available for download on Amazon, here. Proceeds of sales contribute to the production of The Painter’s Keys. Thanks for this letter! It is illuminating and helpful. 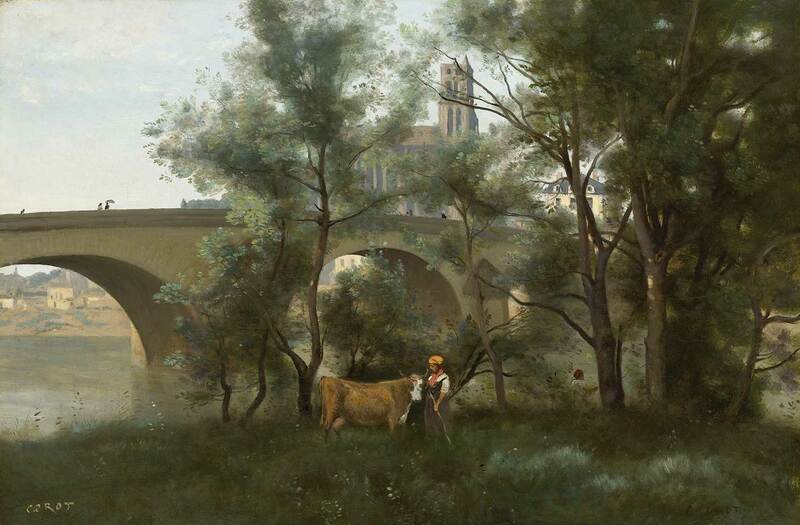 I particularly like Corot’s oil painting, “Mantes, the banks of the Seine at the foot of the bridge” It is beautiful! Thanks again! Diana was surprised bathing by hunter Actaeon, with his dogs. She was so mad, she turned Actaeon into a stag, and his own dogs chased, killed, and ate him. That’s Actaeon over there on the right of the painting. Diana – first pole dancer? Diana is pointing at Actaeon who is already beginning to sprout antlers. The young lovely swinging on the pole is one of Diana’s maidens. Her quirky behavior is one of those special adlibs often found in great art. When Daumier was old and blind he was turned out of his home for not paying his rent. Corot bought a small cottage and wrote his friend a letter. “Dear friend, it seems I have a problem, I have a small house and no one to live in it. 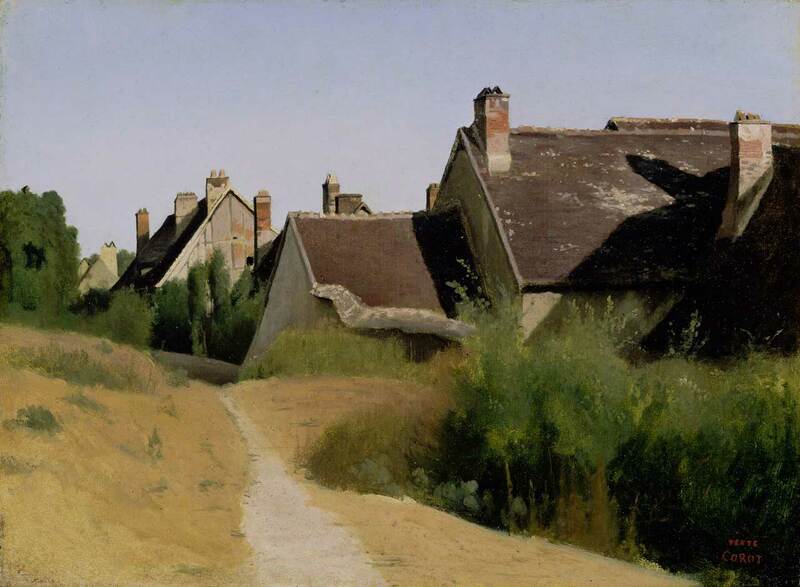 Would you be so kind as to do me the favor of living in it for me.” Corot said he did it to annoy the landlord. Greece: Watermedia workshops with G. Politis AWS, RI . 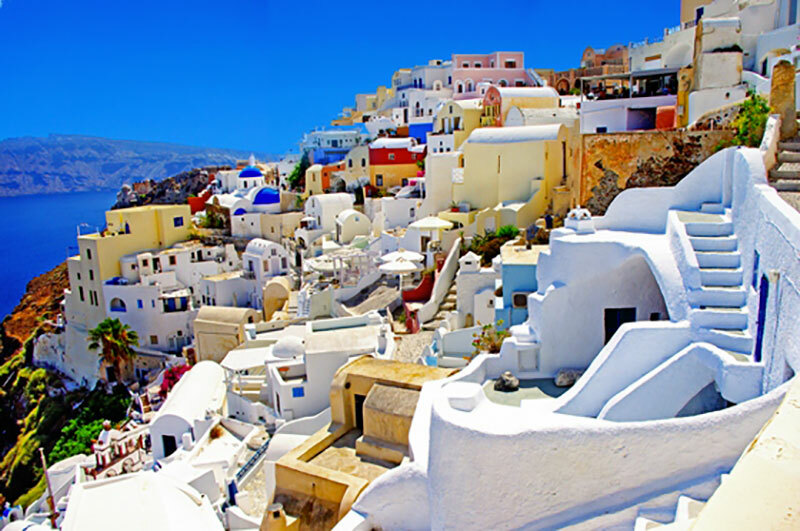 Watercolor Workshop – Painting Holidays in Santorini (5-12 July) and Thassos (26 August – 2 September) islands in Greece. Join George Politis AWS, RI in a journey of creativity. Both islands are majestic, beautiful and quite hotels to stay, paint and also have as starting point to explore the islands. Painting in pure watercolor and mixed watermedia. Focusing in composition and experimenting. All levels are welcome. Every session starts with a demonstration and then we paint together. Maximum of 12 students. Price is all inclusive (hotels, three meals per day, transportation during the workshop and tuition). Candace studied at the Ecole des Beaux Arts in Angers, France but it is her travels in the deserts of Africa and Oman, Antarctica and the Arctic, and sacred sights of Machu Picchu and Petra that serve as her true place of learning. A desire to combine these experiences with a deeper understanding of her own spirituality has provided the underlying focus and inspiration for her paintings.